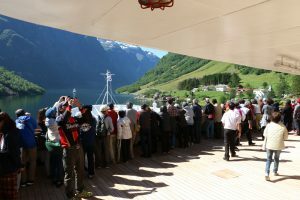 After saying goodbye to Bergen, Norway, we sail into the Sognefjord. 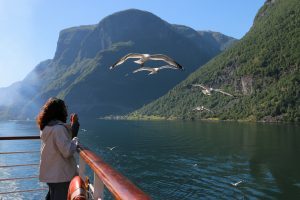 The Sognefjord is the largest and best known fjord in Norway. This time we were super lucky because it was a very sunny day! The last time Peace Boat had this great weather here was ten years ago! 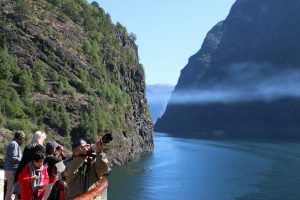 At the end of fjord, there are Flam and Gudvangen, villages that are World Heritage Sites. 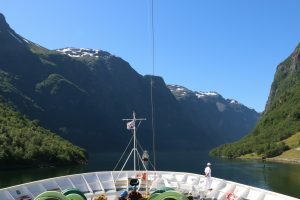 We sailed into the Sognefjord in the early morning. Everyone taking pictures on the front deck. The view was really astonishing! Even the seagulls flew with us. 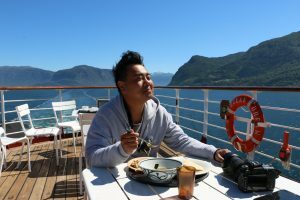 We had lunch while enjoying the great view. 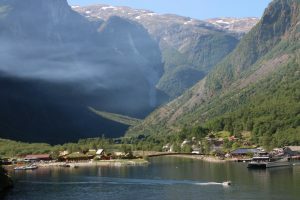 This is Flam, a village that is a World Heritage Site.